Sign up for Broadjam today to follow a fake smile, and be notified when they upload new stuff or update their news! 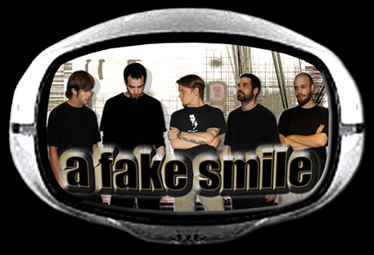 A-FAKE-SMILE is a 5 piece hard rock band from Chicago, IL, together since 1998. The music is a mixture of raw energy, seriousness, and sarcasm. AFS has been featured on 94.7fm The Zone-Chicago, 1240am Rebel Radio-Chicago, 96.7fm-Bloomington, 102.9fm-Mendota, and have also been interviewed and performed on Chicago's CAN-TV show, Expose. AFS performs through-out Chicago and the midwest, and have played many of Chicago's great venues including the famous, Double Door. Spending every dime made from CD, DVD, and clothing sales, they rapidly gain fans from their relentless self-promotion and endless networking through a creative website, and thousands of free demo samplers, stickers, and fliers. They have also had many commercials on Chicago's 94.7fm, and have had CD's in 13 stores around Chicago and the surrounding suburbs. In the end we're still five best friends completely surrounded by music, doing whatever it takes to make a living doing what we love.